As was the case for the first ChemMedChem December, 2007 cover issue (posted previously), the cover story in this month’s issue is a communication by myself and members and collaborators of the Robert Doyle Group here at Syracuse University. In this case, the work for the cover image actually went into computational research published in the associated article (instead of just a pretty cover image to complement the associated article, which was the intent of the previous cover). 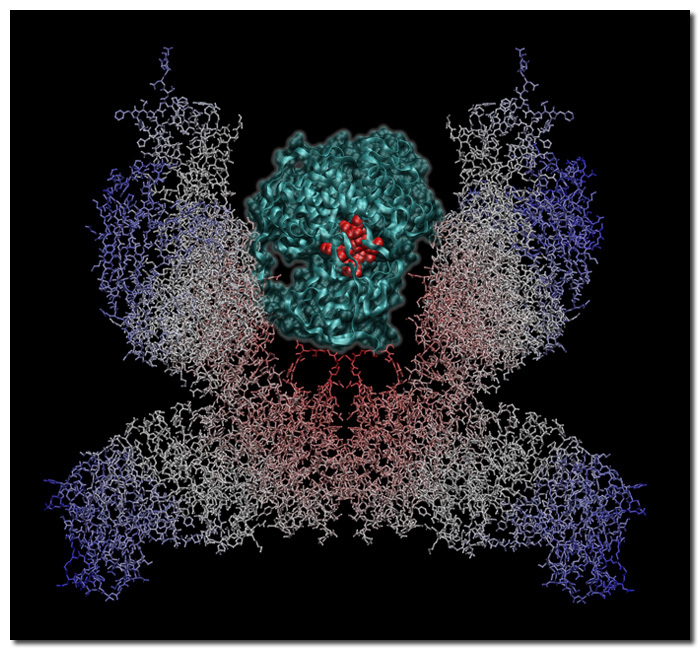 The image below shows the Transcobalamin II (TCII) protein (in teal ribbons, with a bound cyanocobalamin (B12) shown in red. 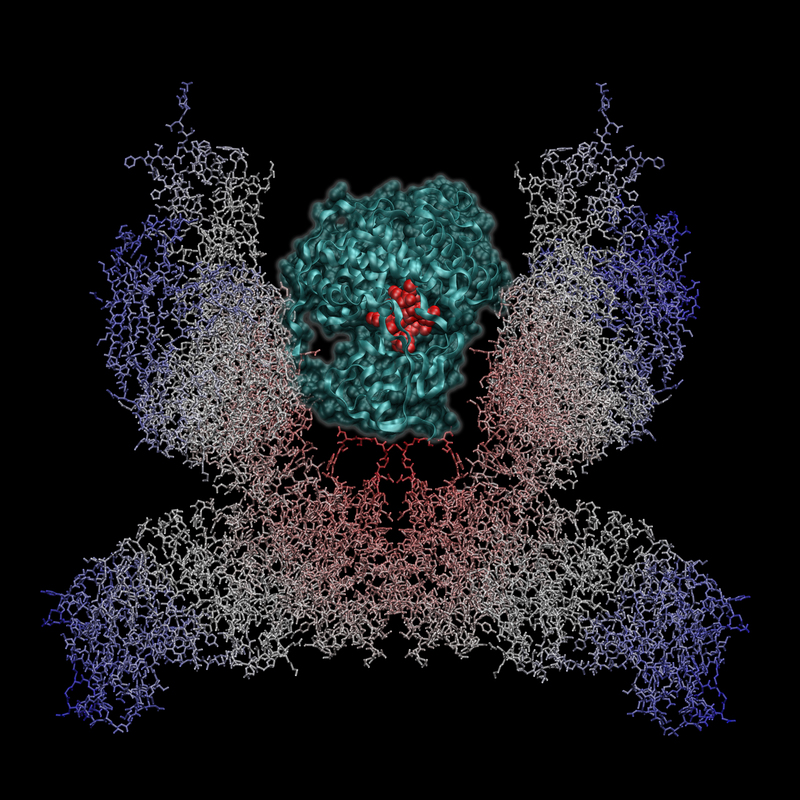 The PDB code for this complex is 2BB5) sitting within the surface-accessible fragment of the gigantic insulin receptor (PDB code 2DTG. The cell membrane would be at the bottom of this image, with the remainder of the complete protein sitting both within the cell membrane and then into the cytoplasm). Saving the lead-up to this structure generation for the associated published article, this image was created to show one of the most important steps in the Oral Insulin project being worked on in the Doyle Group, with the fact that we know it works making the validity of the image content all the more relevant. In brief, this figure shows that the TCII/B12-Insulin complex can fit within the insulin receptor such that the insulin molecule can bind to its receptor position on the appropriately described insulin receptor (IR), thereby instigating the cascade of events that leads to cellular glucose uptake. Like many of the protein structures I render, this image would not have been possible without VMD and MegaPOV, my favorite OSX POV-Ray variant (there’s quite a bit of Photoshop layering as well). The final layout for the cover is below, which I think would have benefited from the aerial view on the upper left side being shifted slightly to the left to fill out the black square. 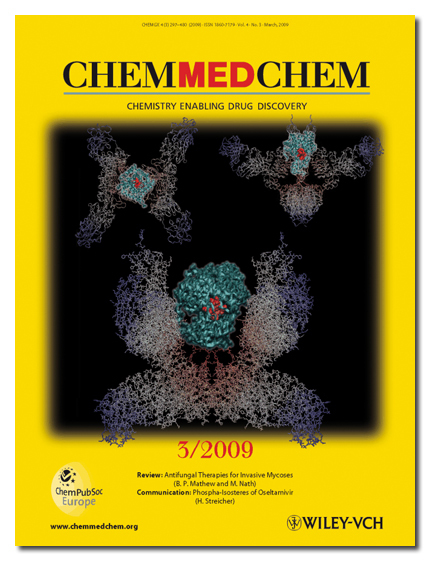 The cover picture shows three views of a vitamin B12-insulin conjugate bound to transcobalamin II, docked in the insulin receptor (IR). This study reveals how the structure of an orally deliverable insulin changes in solution after vitamin B12 conjugation and its effect on IR binding capacity. The results demonstrate that chemical modification of insulin by linking relatively large pendant groups does not interfere with IR recognition. For more details, see the Full Paper by T. J. Fairchild, R. P. Doyle, et al. on p. 421 ff. To date, the associated work has received some additional linkage, both in the form of inclusion in the Spotlight list in Angew. Chem. Int. Ed. 2009, 48, 2072 – 2073 and, for those looking for a more pop-sci discussion of the applications of the research, New Scientist (Insulin Chewing Gum, 14 January 2009). PDFs of the associated content are provided here for Angewandte Chemie and New Scientist. There is a considerable amount of additional computational work being done on this system and the complete B12 pathway for potential use in various other applications. Stay tuned for next year’s cover.